Woodgreen began to grow into a village with goods and services for the local community in the nineteenth century. By 1841 there were three bakers, a butcher, and a grocer in the village. Ten years later, there was a baker but no grocer is mentioned. By 1871 there was once again a grocer. It is unclear where any grocery store was located. Nearby Breamore Mill produced flour, initially for bread, but before it closed it produced grain for cattle feed. Eels were caught there too, as well as in the ditches along Hale Road. Coal could be bought from Mr Harrington, who had a coal-yard half way up The Hill, behind the Village Hall. He delivered both coal and grain from the Mill by lorry, and employed one other person. 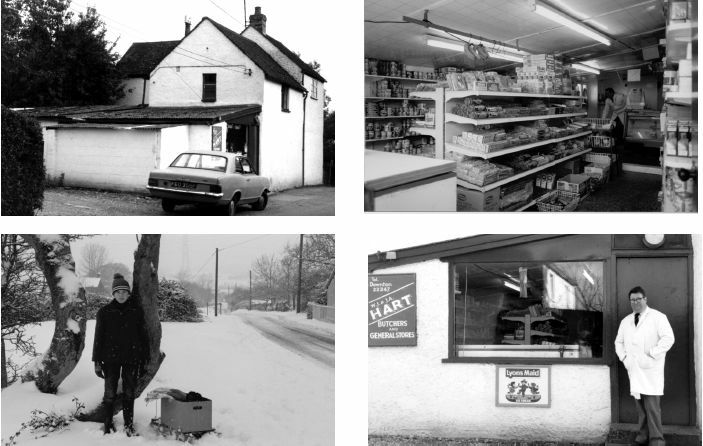 The story of Woodgreen village shop has been one of change and survival. The old village shop and Post Office was built as an extension to a 17th century thatched cottage in the first years of the Twentieth Century. Certainly by 1907 there was a postmaster, Stephen Marlow in post. He is recorded as having been there until about 1920. 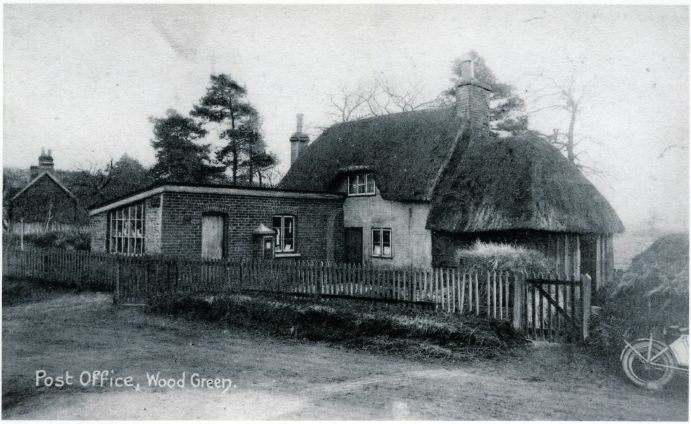 By 1924 Woodgreen Post Office was being run by a Mrs Noyce from the front room of her house, now Meadow Cottage in the High Street. 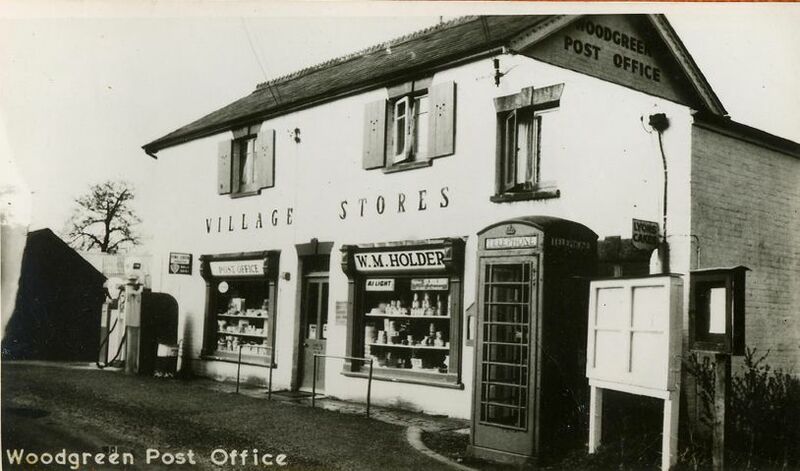 The Post Office and shop subsequently moved to The Old Post Office House in the High Street, (now a private dwelling) where there were also two petrol pumps with wind-up handles, and a substantial grocery store, with living accommodation. There was also a bread round and, for a while, a taxi service. At that time, the village shop sold second hand furniture. When the Old Post Office and shop closed, the Post Office was given a small space back in the premises in which it had originally been housed, with Audrey Chitty as postmistress. Other goods were gradually introduced and eventually displaced the furniture to become the village shop as it was until 2011. Many villagers, including Sue Miller and Barbara Cunningham (who also ran the shop with her husband Roger until the Woodgreen Community Association took over in January 2007), have worked in the shop in its different locations and throughout changes of ownership. In addition, there was a garden shop attached to the Hale Nurseries. Further along the High Street was a butcher’s shop. The last owners of this business before it closed in 1986 were Jim and Jenny Hart. As can be seen below, they also sold groceries. The loss of village retail outlets is therefore not a new phenomenon in Woodgreen, but certainly an accelerated one. Village retail outlets have become more difficult to sustain in part because of easy access to nearby towns and supermarkets. For Woodgreen, as with most villages that still have them, the Post Office and shop are an important and, for some people, a vital resource. The shop is a meeting place, communication centre and an important lynch-pin of village life. This issue became an important part of our questionnaire when the business once again became threatened with closure in 2006. It became evident that the Shop and Post Office would only continue if the lease was acquired by the community. 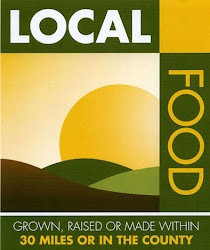 In November 2006, a well-attended public meeting endorsed the idea of setting up a Community Association to take over the ownership and running of the shop. The village pulled together, with shares, donations and practical help, and by the deadline of 31st December 2006 everything was in place, and the Shop and Post Office was taken over by the Woodgreen Community Shop Association Ltd. on a five-year maximum lease. Only just seen this question. The old shop has been demolished and the original house renovated with a porch to the front door and an extra room at the side. It is now a very attractive house and the new shop is doing well. My parents Eileen and Douglas Worth ran the village shop and post office in the village in the 1980’s . They would have proud of what you have achieved. Has the old shop been turned back into part of the old house?